For the 24 hours to 23:00 GMT, the AUD declined 0.25% against the USD and closed at 0.7110. LME Copper prices rose 0.5% or $33.0/MT to $6520.0/MT. Aluminium prices rose 1.7% or $32.0/MT to $1891.0/MT. In the Asian session, at GMT0400, the pair is trading at 0.7105, with the AUD trading 0.07% lower against the USD from yesterday’s close. Overnight data showed that Australia’s CBA flash manufacturing PMI fell to a level of 52.0 in March, compared to a reading of 52.9 in the previous month. Meanwhile, the nation’s preliminary services PMI rose to a level of 49.8 in March, following a reading of 48.7 in the prior month. 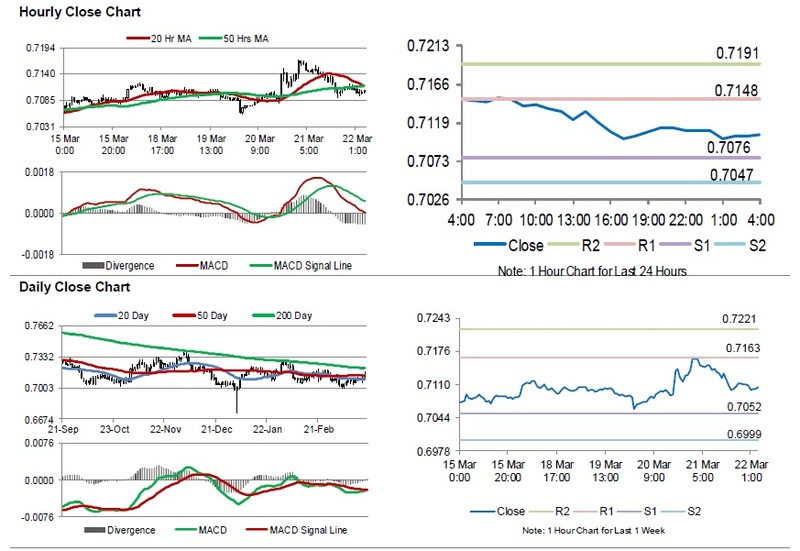 The pair is expected to find support at 0.7076, and a fall through could take it to the next support level of 0.7047. The pair is expected to find its first resistance at 0.7148, and a rise through could take it to the next resistance level of 0.7191. Amid lack of macroeconomic releases in Australia today, traders would closely monitor the global macroeconomic events for further direction.